edit: Gotta say, I love the art. It looks like a MTG card. If discover spell will be great, minions not so much. 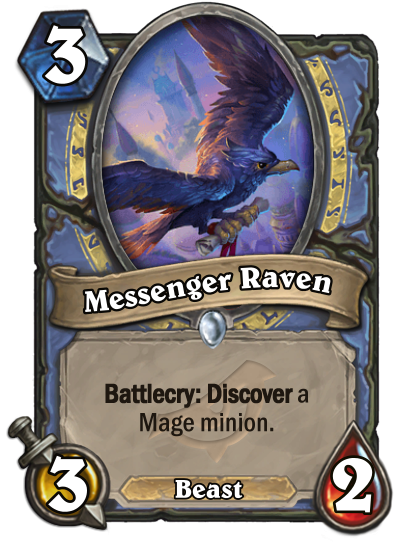 Maybe see play in hero power mage to find more Jan'alay or Darings. There are some decent mage minions out there. I said "decent", not good. It might see play but this is much better in Arena. Unless you can get Sunkeeper Tarim (Stonehill Defender) or Kathrena Winterwisp (Stitched Tracker) there is no point of playing this instead of an actually good minion. There are quite powerful mage cards which you would like another copy, specially kalecgos. and this can discover itself too. also tracker saw play, can see this seeing tonnes of play. Stonehill Defender and Stitched Tracker saw play, because they could consistently pull a great minion due to their restrictions (taunt and minion in your deck), so they worked in certain classes and certain decks, this card does not have that consistency and most options will be extremely average. A good card. Cards like Kalegos are a lot better if you don't actually have to put them in your deck. That said, I don't see a deck for it currently. This doesn’t do anything for me. It’s a fine card but probably not good enough to see play in standard in all but the most value of value mages. Going to need some synergy help to be much more. With Raven Familiar, Year of the Raven is now bunk-ended by ravens. No ravens in the year itself, though. Vex Crow can count as a raven. Thank goodness it discovers a minion, not a spell! Anyway, it's... ok. Probably an arena card. I know that without Baku it's going to take more work to get Jan'alai, the Dragonhawk to work, but it might just be worth it. Especially if you can get two Rags via Khadgar. Yes, it's all very slow, but we've seen Control Mage happen before. You don't have to craft or run slow, expensive mage legendaries when you can just discover one or use it to discover a water elemental vs. aggro decks. Great card like stonehill defender, but I will run this instead in my renomage. I think this is super Strong! Discover card with limited pool = go into my deck. A Light in the Darkness always remember. Unlimited pool trash card.